The Dubliner, who is back in action for a three week run in the US after taking a two-week break, played solidly for the first 12 holes before a three-putt bogey at his 13th hole and the threat of flyers from the rough made play cautiously on the way home. Inside the top 10 when he finished his round alongside Phil Mickelson (71), he ended the day tied for 27th and just three strokes behind leaders Nathan Green, Martin Flores, Davis Love III, Stuart Appleby, Glen Day and Harris English at TPC Southwind. “I was quite pleased with my one under when I was seeing that everybody else was struggling,” Harrington told PGA Tour radio. “I had gone through about 12 or 13 holes - I three-putted my 13th I think. Up to that I was two under par and it should have been more. Judging shots from the rough will be crucial to Harrington’s chances at TPC Southwind. The greens were the biggest conundrum for the Dubliner, who will need to at his best with the putter in next week’s US Open at Merion. “One thing that might catch the players out today and it certainly caught me out was that I feel the greens got quicker from yesterday,” he said. “They were slow yesterday and today they seemed very quick. Starting on the back nine, Harrington birdied the 13th thanks to a 176-yard approach to three feet, failed to get up and down from sand for birdie at the par-five 16th and missed a chance from nine feet at the next to turn in one under par. He missed a 13 footer for birdie at the first but got up and down from 20 yards for birdie at the par-five third before he dropped his only shot of the day at the par three third. After hitting a 182-yard tee shot to 32 feet, he knocked his birdie chance three and a half feet by and missed the return. From there it was a question of not letting further shots slip away and he scrambled well to save pars at the fifth, sixth, seventh and ninth. While there was a gentle breeze blowing, Harrington said it sounded stronger than it was actually blowing, leading to more confusion. “The sound of the wind felt like it was blowing harder because it was blowing in the leaves in the trees but it really wasn’t blowing at all out there,” he said. “You were leaving shots if you were trying to hold it up in the wind. Graeme McDowell got off to a red-hot start in the St Jude Classic but Padraig Harrington's cold spell continued at TPC Southwind in Memphis. McDowell hit six birdies and two bogeys in a four under 66 that left him tied for second place, just two shots behind leader Brian Gay. Harrington and Mickelson kept it light in MemphisBut it was another frustrating day for Harrington, who had to settle for a two over par 72 alongside Phil Mickelson that leaves him battling to avoid his third missed cut in a row and his fourth in five starts. 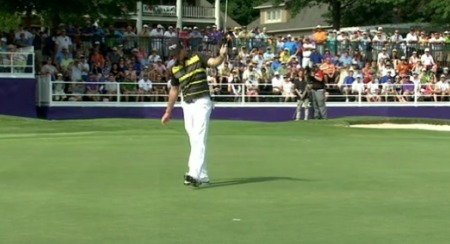 Rory McIlroy raises his putter in salute as he birdies the 18th in the third round of the FedEx St Jude Classic. Rory McIlroy and Padraig Harrington will go into the final round of the FedEx St Jude Classic with clear options of victory yet both produced error-strewn third round performances at a blustery TPC Southwind that did little to inspire confidence in their chances at next week’s US Open. 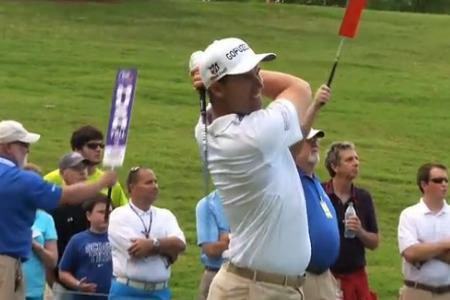 Padraig Harrington holed almost everything he looked at on Saturday in Memphis. Rookie Shawn Stefani will have Padraig Harrington and Phil Mickelson waiting eagerly for him to slip up after the multiple major winners shot third rounds 65s to move into the mix in the FedEx St Jude Classic in Memphis. Padraig Harrington holed a 43 footer on the 17th en route to a final round 71 and a share of 10th in Memphis. He might have had a tough day from tee to green but Padraig Harrington declared his 10th place finish in the FedEx St Jude Classic a success ahead of this week’s US Open “grind” at Merion.